In a time crunch, but craving Mexican? Look no further. Inspired by the robust, spirited flavors of regional cuisines, Frontera® Foods offers mouthwatering mealtime solutions that allow you to create a gourmet Mexican experience from the comfort of your own home! Frontera Foods are made with high-quality ingredients and time-honored cooking methods, so each meal is full of bold flavor. While the flavors are complex, the preparation is simple! Frontera Frozen Skillets are great mealtime solutions that contain fire-roasted veggies, tender meats, and layers of seasonings. And the best part? They are ready in minutes! 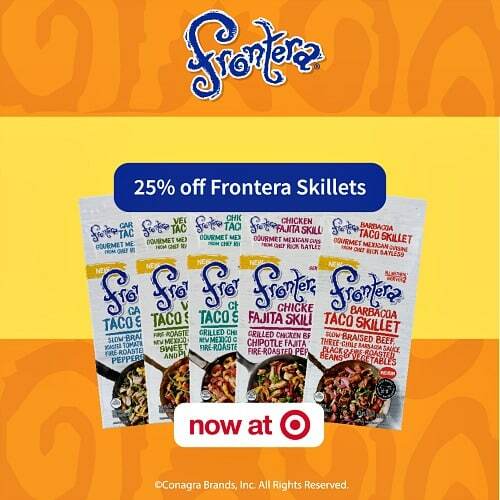 Right now until 11/25, there’s an amazing Cartwheel offer available for 25% off Frontera Skillets at Target! Click here to download this offer before your next Target trip so that you can stock up on all of the Frontera Skillets varieties! Make sure to follow Frontera Foods socially to stay up-to-date on future promotions, and check out the brand here to learn more!